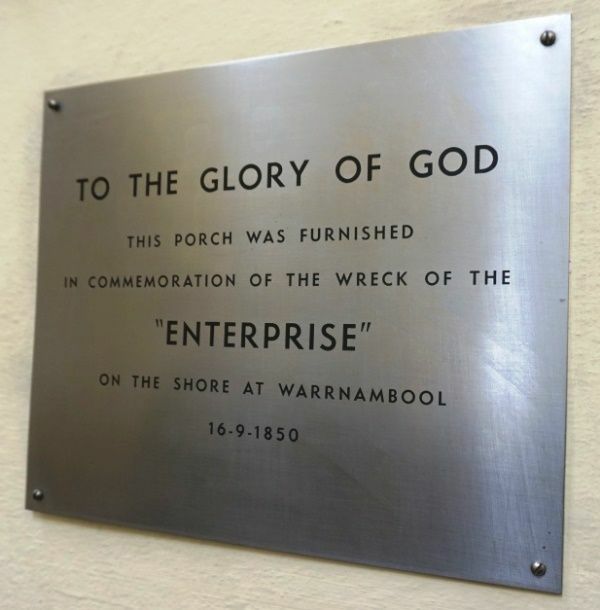 A plaque states that the furnishings of the porch of the church commemorate the sinking of the "Enterprise" in Lady Bay in September 1850. The New Zealand-built schooner Enterprise had sailed from Melbourne and was anchored in Lady Bay, Warrnambool when a south easterly gale swept in on 14 September 1850. The vessel began to drag its anchor, grounded, then went broadside onto the beach. A local Aborigine, Buckawall, struggled through the rough sea from the shore and secured a line to the Enterprise, allowing the crew to land safely. The vessel became a total wreck.